DHS player Russ Balla powers past the Broncos defender. The Eagles skated to a 5-3 victory. Following up last weeks Tourney win in Winkler over Kenora Beaver Brae, DHS had to face the Broncos twice more in league play this past week with favorable results. 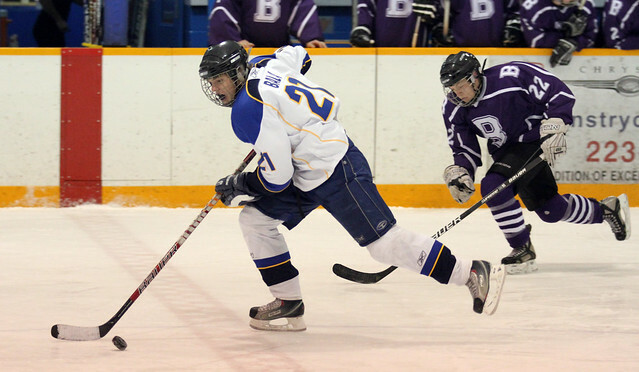 On Tues Jan 11 in Kenora…DHS wins 3-2 in another shootout. Jared Stratford and Zack Pitchenese scored in regulation and Stratford scored the eventual game winner in a shootout while Justin Oltsher stopped all 3 Kenora shooters in goal to preserve the win. The line of Tyler Kirouac (2G, 1A), Alex Calvert (1G, 2A) and Zack Pitchenese (1G, 2A) dominated the play each time they stepped on the ice as they accounted for 9 of 10 of DHS’s points in the game. Cody Kaus scored the other DHS goal and Kim Wildhaber played solidly in net to provide DHS with their third win in as many games versus Beaver Brae. Sunday Jan 16, DHS continued it’s dominance over Kenora by defeating the Thomas Aquinas Saints 5-2 in exhibition play at the Dryden Memorial Arena. Goal scores were Carney McConnachie, Tyler Kirouac, Alex Calvert, Kale Kuzemchuk and Zack Pitchenese while Justin Oltsher earned the win in net with a good performance. It was a pretty good week for us. We have played a lot of hockey in the past few weeks and have had some great results. The boys have worked hard to improve on our overall game. Our final test before the exam break will come this Tuesday Jan 18 when we travel to FF to face the Muskies. Last time we travelled to FF we played poorly as a unit…hopefully we can continue our success from this week and play effectively together as a team and earn a few more points with a road victory. Friday night the girls trailed for the first two periods until a pair in the third by Kristen Bartlett tied it up. The overtime period was scoreless, with the game going to a shootout. Alexis Reid opened up the shootout with a goal, but the other Eagles shooters were unable to knock it home and the girls ended up on the wrong side of a 3-2 hockey game. On Sunday the girls bounced back and rolled over Sioux Lookout in a 10-2 win.